Improving your online training request experience with our new email auto-responder and notification templates. When we just started our online service, we only took the default email template from our online form provider as our email notification template. It was used to send notifications to our I'MTP members, informing them about the new training request from a specific site visitor. For in-house training request, the requestors didn't even have a reference copy for themselves after submitting their request. When ones become too busy with their work, they can't even remember what they had sent few days ago. Furthermore, sending a reference copy back to the users is in fact a basic feature that we should incorporate and we neglected it. Earlier, only online public training registration requests were given an auto-responder that contained their registration information as we thought that it is necessary for the participants to remember the training event that they need to attend several weeks later. Now, with our new email auto-responder and notification system, you can have it all (see the sample screenshot below)! Sample reference copy of an in-house training request to be sent back to the requester. Well-formatted HTML email auto-responder for users and training request notification for training providers. This new design applies to both in-house and public training requests. 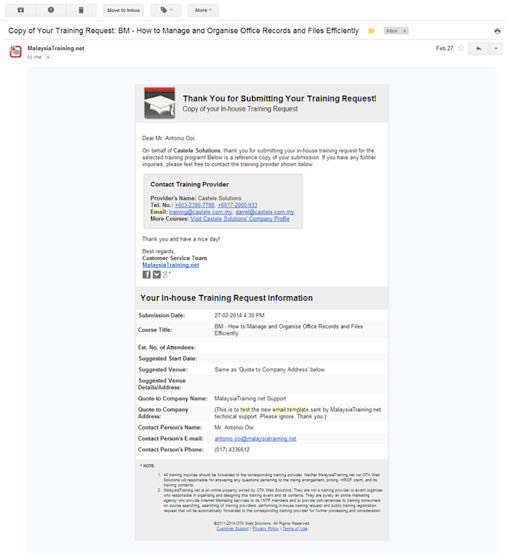 Users who requested for in-house training now also have their reference copy being sent to their mailbox. Before that this service was only available for public course registration request. All email notifications and auto-responders will have the Submission Date local to the submitter's time-zone. Earlier, users and training providers can only base on the email date sent by JotForm, our online form provider. Sender's Name is now MalaysiaTraining.net and sender's email is now [email protected] to minimize the chance of getting such email to be diverted to the recipient's spam folder by their email client application or mail server. When the recipient clicks on the Reply button on their email application, however, training providers will have their customer's email address automatically filled as 'reply-to' email address and customers will have their training provider's email address automatically filled as 'reply-to' email address. To facilitate email search, training providers will have the customer's company name appear in the subject line. Another reason for this change is that, our online form provider (JotForm) no longer allow the email address filled by the users as the sender's email address. This is their latest service terms. As emails sent by '[email protected]' may be treated as 'junk mails' by certain users, we've decided to use our official [email protected] email account to minimize this issue. The reason is that, when the users been to MalaysiaTraining.net and perform an online training request, users may have the expectation to receive email from MalaysiaTraining.net but not JotForm.com. Therefore, it will be much easier for the users to recognize MalaysiaTraining.net than JotForm.com. share your contact information with other training providers, including our members, except the one whose training you're requesting for. sell your contact information to any other training providers, online email blasting and marketing providers, or any other parties that need it. use your contact information to spam your mailbox with other irrelevant information or to promote other third party product and/or services. Please note that we don't provide email blasting service to any of our members or customers. Email Blasting had never been included in our service model since we started MalaysiaTraining.net. Apparently, our reason is simple: To make our site visitors feel safe to submit their training requests to their intended training provider through our website. By allowing them to feel safe, then only we can gain their trust and enabling them to return to our website again and again. Therefore, if someone tell you that they have your contact information bought from MalaysiaTraining.net, then this has to be a joke as it defeats our own branding philosophy that hurts our own business if we were to betray our own principles. However, if you send your general inquiry to us through our online inquiry form, we may need to forward your request to those members whom we believe might be able to fulfill your training needs. This is why we also encourage our site visitors to find their desired training providers to deal with through our training providers page.